This week I got to stage a beautiful historic property to sell. 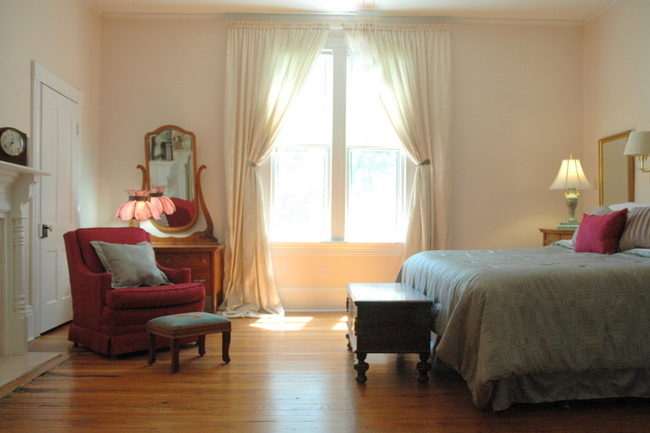 It was a Bed & Breakfast for years, and formerly served as a girls’ academy in the early 20th century. Staging a home like this is a challenge. 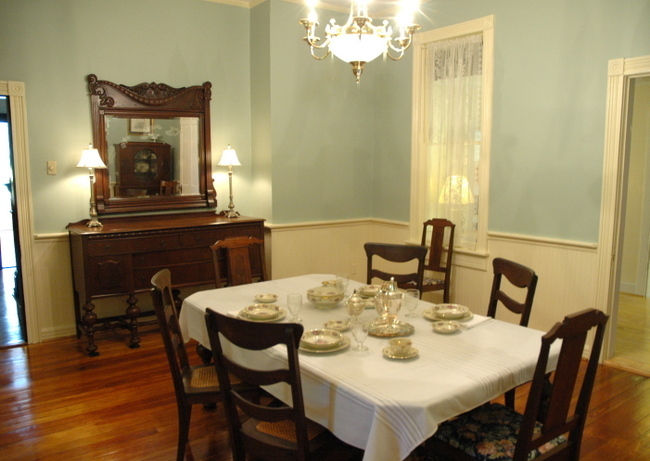 While you want to make it appeal to the widest audience possible, you have to realize that most of the people interested in buying that type of home are attracted to historically-decorated interiors. So, a balance must be struck. 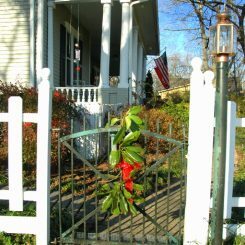 I’m going to share 3 things that were important to freshening up this older home. These tips are applicable whether you are selling your home, or you just want to update without losing the character of your older home. 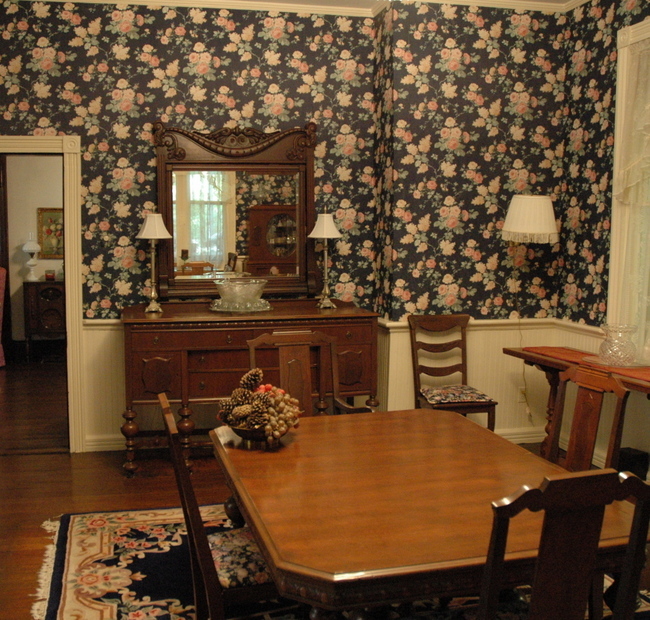 If the wallpaper in your home was put up in the 1970’s or 1980’s, chances are it doesn’t look historic. It looks like the 1980’s version of historic. Replace wallpaper with a historic-appropriate wall color. Some great historic colors include Benjamin Moore‘s Palladian Blue, Georgian Green, and Adams Gold. 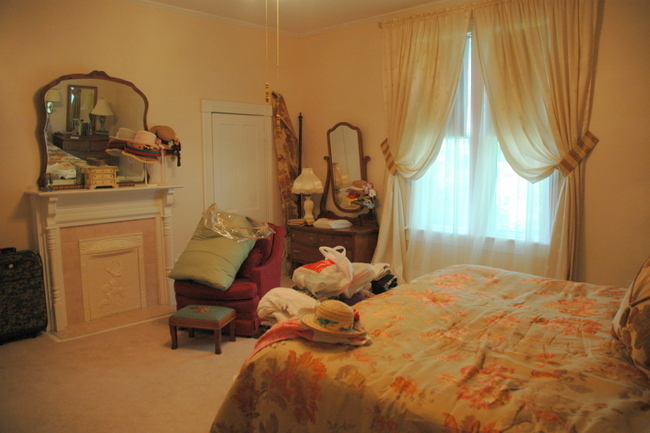 Ok, next tip: pair down any fussy draperies and window coverings. I know they were used historically, but they block natural light and views to outside. Too much lace and window sheers can make rooms feel darker and gloomy – just take them down. It’ll make everything brighter and more inviting! And finally, put the focus on the architecture by toning down the patterns and ornate decor. 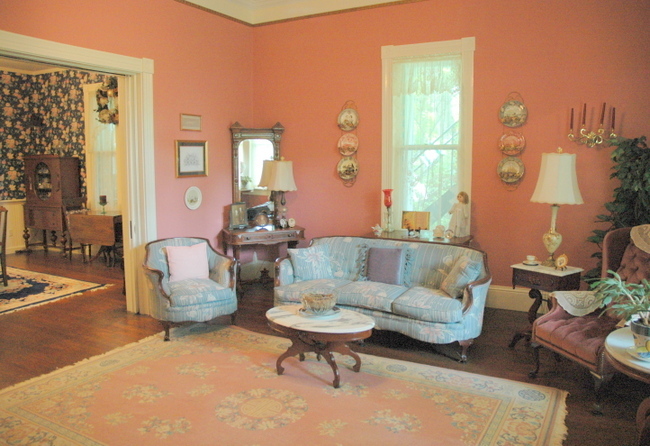 By painting the bright pink room a color that is easier on the eye and removing busy patterns and rugs, the room is now all about the beautiful architecture: the wood floors, the tall ceilings, the pocket doors, the gorgeous trim. This beautiful home still retains its historic charm, but it can now stand up to the competition in the real estate market. Any other ideas for freshening up an older home? 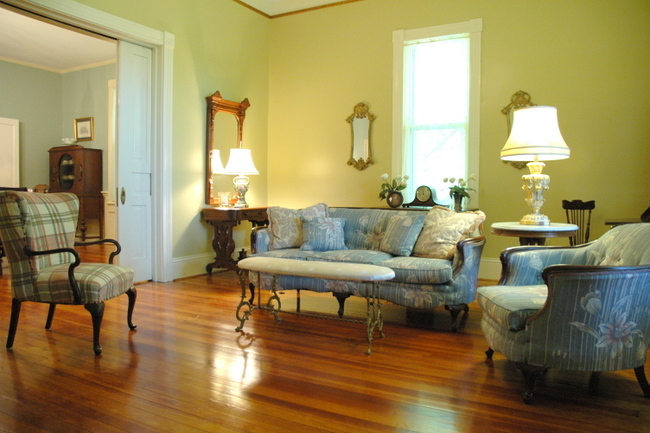 This entry was posted in Design Intervention and tagged adams gold, bed and breakfast, benjamin moore, georgian green, historic, historic colors, home, paint colors, palladian blue, real estate, stager, staging, victorian, vintage, wallpaper. No, this home is in Mt. Pleasant and the couple living there are not divorcing – it must look like your friend’s home, though! Sounds like you did all the right things – good insight!!! Great job Kristie! 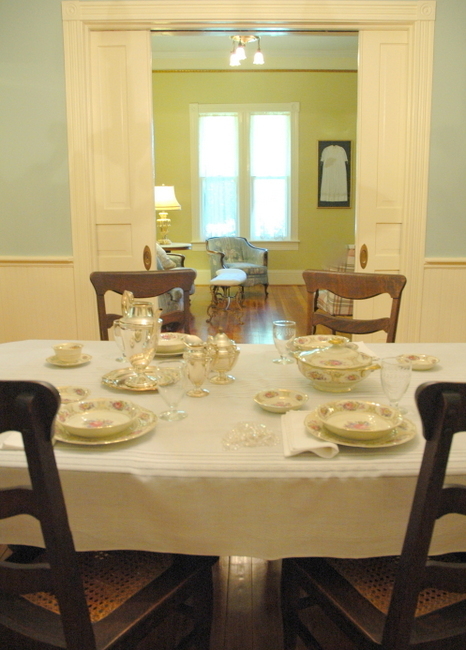 Love the “’80s version of historic” dining room transformation. That sort of wallpaper seemed to be in every B&B of the era, along with shiny brass faucets in the bathrooms, and teddy bears on the beds. Ah yes, the teddy bears . . .
Great Post kristie, it is a balancing job between keeping the charm and updating it at the same time..often on a very tight budget. You did a great job though. Hope it sells quickly! Amazing transformation, Kristie. I love Georgian Green in almost any house! I like to add contemporary toss pillows to older print or plaid furniture to give a space a more updated look. Let us know when it sells. I use rugs to define conversation/seating areas, but I usually don’t use them when staging just because it makes the room feel bigger without any rugs. 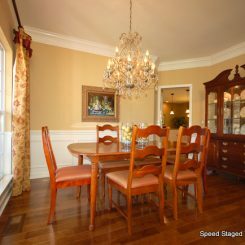 Great tips, and the staging looks authentic. I love the colours you chose… what a gem this beautiful character home is. PS: I love the 1st photo of the staged DR table. It so brings back the grace of a quieter, lovely time. It’s amazing what going from wall paper to paint did to that room! It feels so much brighter and bigger, but doesn’t lose it’s historic charm with the change. And letting in more light is always a good idea! These are such great changes. I love your work! Great post, I love the color you choice.